Gardening to attract butterflies is a whole lot easier if you've got the right butterbait. Not all butterfly plants are created equal, even within the the same genus! The troublesome thing, is that some reputable garden sources don't even know which particular plants yield the best results. Two years ago I witnessed an amazing spectacle of monarch butterflies swarming around a liatris plant with showy leaves. I pulled over to the road side and got out to investigate. This was definitely liatris, but not the shorter, less showy Liatris spicata in our garden. I hurried home in excitement to call the garden center to find out what kind of liatris this was and how I could get it. The lady on the phone said she was not sure, but assured me that all types of liatris attracted monarchs equally. Huh? There are plenty of monarchs in our area, but they rarely touch our liatris. She may have been the expert, but I know what I saw, and at that point I realized there were more reliable sources of information out there. The plant information listed here comes from my own first hand experience and from experience of trusted third party sources...in other words, from people who actually butterfly garden themselves! This page will be updated as we learn of more butterfly magnets. Let's get started so you can get started on your garden. These are the plants that nourish the caterpillars so that they can become butterflies. Some gardeners will plant the same plant in a couple areas designating one area for the caterpillars and one for themselves. An example of this would be "Dill". Caterpillars can have voracious appetites and this can add up to a pickleless summer for you! So keep this in mind and plan accordingly. 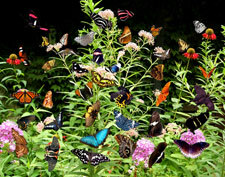 Nectar plants provide adult butterflies with nourishment in the form of a sugary substance called nectar. The butterflies sip nectar through a straw-like appendage called a proboscis. This is a short list of butterfly plants that we know to be tried and true. We will continue to update it.